Diamond Assets provides trade-up guidance and purchase of Apple hardware to help organizations maximize their technology assets. Headquartered in Milton, Wisconsin, Diamond Assets buys outdated Apple equipment from schools and businesses, refurbishes it, and then sells it through various distributors in the U.S. It also helps its clients maximize the buy-back value from future purchases. CEO Mike McKenna says he came up with the idea of an electronic trade-up company as an account executive at Apple. This year, it lands at No. 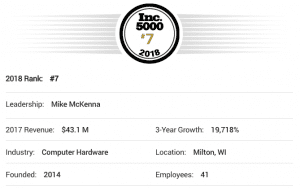 7 on the Inc. 5000, with $43 million in 2017 revenue, up from $217,406 in 2014. The four-year-old company currently employs about 60 people.